In anticipation of the impending kitchen reno (that still hasn't started....) Jake and I walked around Home Depot and Lowe's pricing things out. We'll do a narrow stripe, probably two-thirds of the way up from the counter to the cabinets, with subway tile on either side. Considering the walls above the cabinets and where there isn't tile will be a light grass green and the accents in the kitchen include turquoise (and red. and yellow. and basically any color because I love COLOR), it is perfect. Or as my campers would say - puhhhrrfect. 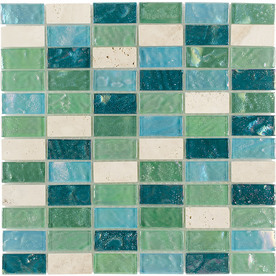 Note: Here's the link to the tile from Lowe's. This sounds like what your Mom was wanting to use for her kitchen too! Amazing tiles and very colorful. I will apply this to my Pavé Tiles.